(MP039). Charles Pears (1873-1958). Oil painting signed not dated..
Standard size 18.5 x 20ins (47 x 51cm) approx. Price band: Paper: Reduced to £90; Canvas £200-235. Both paper and canvas can be enlarged considerably: this is a stunning painting! This magnificent bow view of REVENGE gives some idea of just how massive and seemingly impregnable these leviathans were. Not that REVENGE and her sisters (ROYAL OAK, RAMILLIES, REVENGE, and ROYAL SOVEREIGN) were by any means the biggest of them, for at 28,000 tons displacement and 624 feet long, they were slightly smaller than the Queen Elizabeths who preceeded them, and much smaller than the Nelsons, King George Vs and VANGUARD who followed them. Charles Pears is well known for his clear, uncluttered compositions and bold, vigorous and colourful brushwork. 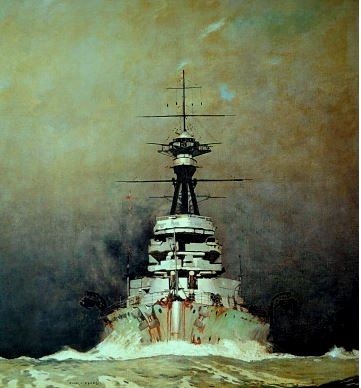 In 1939 he became the first President of what is now the Royal Society of Marine Artists, from whom the copyright of this painting has been obtained. The owners of the picture are the Naval Club of Mayfair who were presented with it by the artist himself.